Review: Suspense, action, and information can all be found in the book Grk Smells a Rat by Joshua Doder. At first glance Grk Smells a Rat seems a bit childish, but after beginning to read this book I didn’t think of the word childish or boring; those two words never once popped into my mind. Grk has it all - not just suspense, action, and information, but this book doesn’t reach far out there to an extent that the words the author wrote don’t make sense or seem real. So this book also has reality in it. Your whole family could read this book and still be interested. Overall Grk is an exciting book that anyone can read. 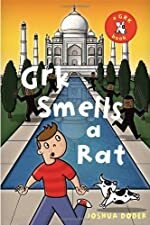 Grk Smells a Rat is the second book in the Grk series but you don’t need to read the first book in order to read this book. The tale of Grk is the story of the Malt family’s vacation to India that takes an unexpected turn that could have them meeting their deaths. Since the Malts are from England, they know nothing about India. But they meet a young boy named Krishnan who is not living the life he’d like to be living…with his parents in his own village. Instead he is living a life where he must deceive tourists in order to make money for his leader. Will Krishnan disobey his leader in order to save his sister and himself? Will the Malts wind up dead? You can find all this out in Grk Smells a Rat. I enjoyed Grk so much; it has everything a good book needs. I never wanted to put Grk down. As I stated before, Grk has information in it, and what I mean by this is it’s not a text book. But every once and awhile the author adds in a fact about India, or a myth that Indians still believe to this day. My favorite character in this book is Grk, the cute dog in the story. I like him the most because he is like the detective in the case. He is like Scooby-doo with Shaggy, the assistant detective, the clue finder. His animal instincts help Tim find what he is looking for, whether it is a blue rat, criminals, a bomb, or simply a good place to “take a pee”. Grk adds so much more to this story. He is the one who adds comedy and suspense. If not for Grk, Tim and the Malt’s could have died along with many other people in India. If I had to rate Grk Smells a Rat on a scale from one to ten, I’d rate it a ten because as I stated before Grk Smells a Rat has suspense, action, and information that made me want to never put it down. I wanted to follow the characters everywhere they went in India. Sometimes little white dogs could know more than you’d ever want to know, so always listen. We would like to thank Random House for providing a copy of Grk Smells a Rat for this review. Have you read Grk Smells a Rat? How would you rate it?